Turn up the music with a funky Bluetooth speaker with a built in Light show. Portable with a rechargeable battery, VHF microphone and USB/SD/FM/BT player for house parties, singers and performers. Compact portable PA unit with sturdy moulded cabinet and carrying handle. Powered via the supplied power adaptor, external 12Vdc or internal rechargeable battery for true portability. Built-in VHF wireless microphone system and USB/SD media player with FM tuner and Bluetooth receiver. Complete sound system for house parties, singers and performers. Headset microphone with VHF beltpack transmitter as alternative or replacement for qtx portable PA units. 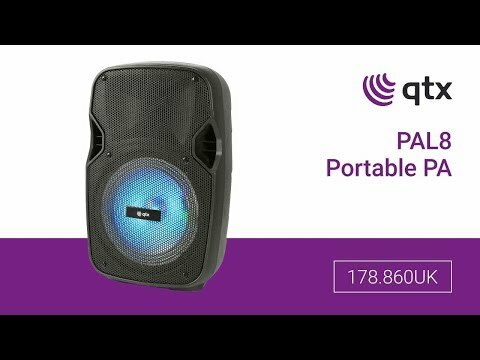 Compatible with Busker, Quest and PAL portable PA units.